Shepherd's pie is traditional British recipe. Traditionally, it was made from leftover lamb (from roast lamb, eaten on the previous Sunday), but today it is usually made from ground ("minced") lamb. Like the closely related dish, cottage pie, shepherd's pie is not made with a pastry crust, but instead is topped with mashed potato, and sometimes cheese as well. Peel, and then cut the potatoes into small cubes. Boil the potatoes in water with a pinch of salt. You will need to boil the water for about 10 minutes, at which point the potatoes should be cooked all the way through - I would suggest you check this using a fork. When the potatoes have been cooked, remove them from the water. You can mash them until you have achieved a smooth texture without lumps. During the mashing process, mix in 1 or 2 tablespoons of butter, and add salt and pepper to taste. Preheat a skillet containing a littlef olive oil. Add the ground ("minced") lamb and cook it, stirring thoroughly so that the meat cooks evenly. Add the chopped onion and carrot after a few minutes cooking, allowing them to cook for about 5 minutes. The meat will become brown during the cooking process, and when the cooking is complete, remove the skillet from the heat. Note: If the meat contains a lot of fat, you can spoon out the fat during the cooking process - but keep it in a bowl, so that you can add some to the gravy (see next step). Most recipes for shepherd's pie include gravy, although some people prefer to forego the gravy and use chopped tomatoes instead. If you decide to use gravy, you can save time by using = gravy from a can, making it from gravy granules, gravy powder or a gravy cube, but if you have time, I think you will prefer the taste if you make your gravy from scratch. To make gravy from scratch: Cook 2 tablespoons of butter and 2 tablespoons of flour together in a fresh pan, stirring as you go, and being carefully not to burn the mixture. Then add the stock, and a dash of Worcester sauce. You can also add a spoon of fat, left over from the cooking process. The gravy should soon thicken. Add the gravy (or chopped tomatoes) to the cooked ground lamb, and stir the two together. Transfer the lamb and vegetable mixture into a baking dish, then spread the mashed potato evenly on top. You will probably find it easiest if you start speading from the edges and gradually work towards the center. When the potato has been spread out, you can fluff up it a bit using a fork to make some peaks. If you like, you can then sprinkle some paprika or grated cheese on top of the potato. Place the baking dish in a preheated oven, 375°F (190°C; Gas Mark 5). You will need to cook your shepherd's pie for about 20 to 25 minutes - when it is ready, it should be bubbling and golden brown on top. When the cooking is complete, the shepherd's pie is ready to serve (although very hot, so be careful). No artificial colours or preservatives. No added MSG. Shepherd's pie recipe mix. A traditional British dish, this blend of onions and sage quickly creates a great tasting shepherd's pie the whole family will enjoy! At Colman's we believe you deserve the very best. That's why we select quality ingredients for all our recipes, which are seasonally harvested to deliver great tasting family favourites. We are also working hard to protect the planet by enrolling our farmers on a sustainable agriculture program called 'Growing for the Future'. A unique blend of sage and onions. No msg or hydrogenated fat. Colman's Shepards Pie mix is a unique blend of sage and onions to transform your mince into a tasty hearty Shepards pie! A traditional, classic English dish that the whole family will love! Colman's Shepards Pie mix is a unique blend of sage and onions to transform your mince into a tasty hearty Shepards pie! A traditional, classic English dish that the whole family will love! As always, Colman's Shepards Pie mix has no artificial colors, preservatives, msg or hydrogenated fat. Colman's Shepherd's Pie packet mix. Knorr Mealmaker for Shepherd's pie is a traditional recipe that gives mince a great nourishing flavor. 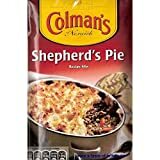 British Foods, Colman's Shepherds Pie Recipe Mix 50g. 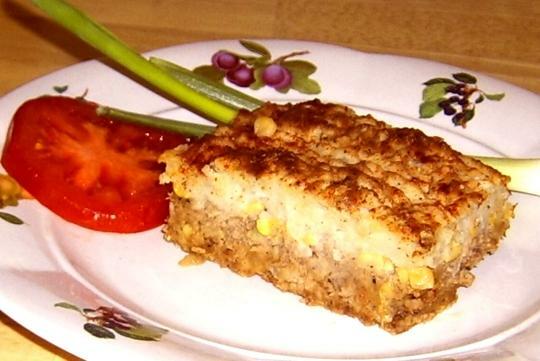 great tasting shepherd's pie the whole family will enjoy! British Foods, Colman's Shepherds Pie Recipe Mix 50g. A traditional British dish, this blend of onions and sage quickly creates a great tasting shepherd's pie the whole family will enjoy! Easy 4 step recipe to make a Family Favorite in 30 minutes! All that's needed to be mixed with beef or lamb along with peas and carrots for the wonderful flavor of Shepherds Pie is in these packs. No Artificial Colors, No Artificial Preservatives, No Added MSG! 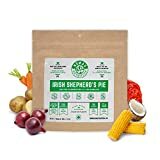 IRISH SHEPHERD'S PIE - Traditional shepherd's pie might need minced lamb to satisfy cravings, but our vegan version keeps your body fuelled and your taste buds happy with a delectable blend of healthy ingredients. This is backpacking food at its finest. REAL FOOD, REAL TASTE - We don't put anything in our meals that we won't eat ourselves! Each meal includes high-quality ingredients that are sourced from local markets in Canada. Taste the difference! BETTER THAN FREEZE DRIED - Nomad Nutrition uses a proprietary method called REVdry, which allows meals to retain 2x the amount of nutrition compared to other leading dehydrated backcountry cuisine.